If you have lost or found something, please contact Nathan Cooper to report it or claim it. Nathan can be reached at nathanscoope@gmail.com or by phone 819 671 7732 . PLEASE ADVISE NATHAN WHEN YOU HAVE FOUND YOUR LOST ITEM OR IF THE ITEM HAS BEEN CLAIMED. Resolved items will be indicated by strike-through. A paddle board washed up in our bay. We’ve left it on the end of our dock at the Bogie cottage. Kayak paddle in the lake between Cooper and Segal properties . Contact Nathan at 819-671-7732, 613-601-7732 or pick up at Cooper dock. An old white windsurfing board from Croll’s dock. Blue Canvas pontoon boat seat slipcover. Blown away during storm week of July 22nd. I lost a yellow Kayak last fall at the end of November. It was stuck in the rocks on the shore but the weather was too harsh for me to get it out. The next weekend, when I came back, the Kayak had disappeared. It is a single place, yellow Pelican Kayak. Please call me at 613-222-4202 if found. Base for a white windsurfer located opposite Zed Island, Chemin Portage. Please contact Beth Armstrong at 514-972-2384. Last fall, blue and yellow floating swim pad. now turned over on the shore. Maelstrome Body Glove, 3 seat Towing Tube between Alderson and Methot property on Portage. Has been there for approximately 2 weeks. Contact Nathan Cooper, Paul Methot at pamethot@mermaidpools.com or Dave Alderson for recovery. While kayaking in the bay next to Gary Beach last week I found a dock approximately 8*10 at the back of the bay. It is not visible from the entrance of the bay. One has to get behind the natural floating rafts to the left of the bay as you are facing the entrance to see it. Whoever it belong to should try to get it soon as possible as the lowering water levels may trap it for another year with all the tree stumps laying at the bottom of the bay. Near 179 H Vipond property, two docks, one that is about 8×8, and the other which is about 4×4. Please contact Robin at inventive.seven@gmail.com. Swimming raft approximately 8×8 feet with white ladder. Seems to be permanently fixed near the entrance to the bay at the north end of the lake near the big rock off our property. Call Sue Neill at 819 457 1289 or send an email to sue.neill@rogers.com. In the last high wind my dock broke away. 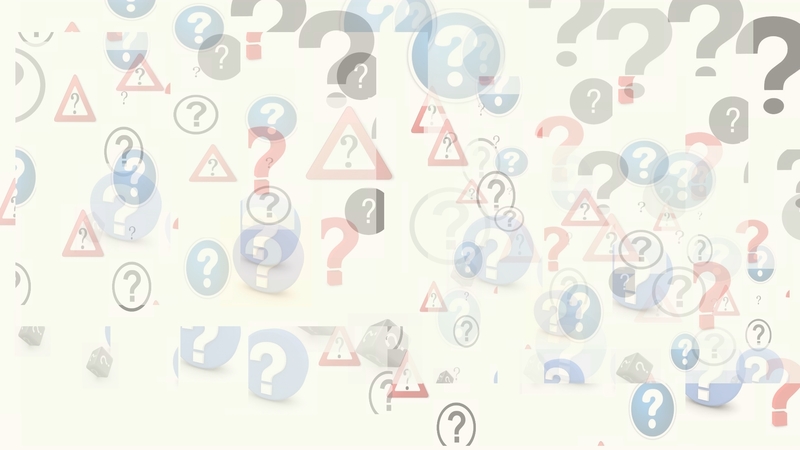 It is a fairly large dock with white barrels to keep it afloat–the ramp is on the end–it has one new board on jthe top. If anyone sees it. Please contact me or if possible tie it up and let me know. Black modular dock lost from the bay by the island with the cross, in the south end of the lake at 223 Powers. I have lost one of the oars (with an oar lock) for my fishing boat. It floated away during this years high water and I’ve searched the shore line without success. 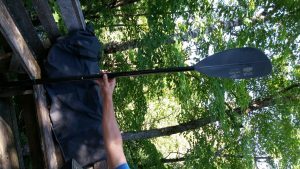 The oars were a gift from a friend and would really like to get it back. A square log about 30 feet long washed up on our beach about a month ago and we’d like to see it removed before getting too stuck in the sand. If no one claims it soon I may be forced to cut it up with my chain saw. Sadly a small white/grey dog with no obvious collar was found washed up near the Garrard cottage on July 14th. It was buried under a tree off the watt road. Last Fall – one 7′ boarding ladder for a pontoon boat. 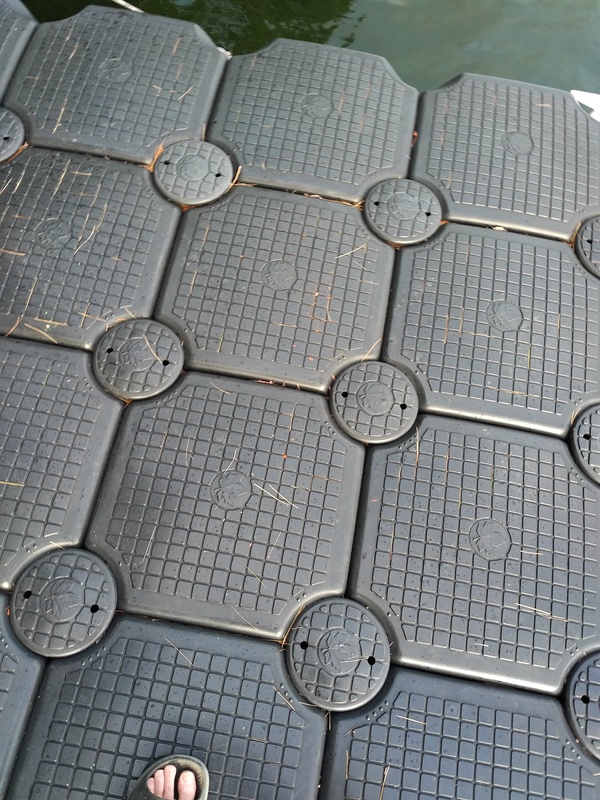 From 255 H. Vipond , Floating swim platform/dock approx size 8×8. 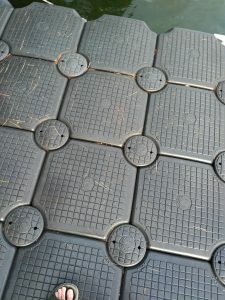 It has O rings drilled into the corners. Lost in the spring 2 white heavy plastic lounge chairs. Lost – Blue Laser sailboat. Contact Shawn Howard, 819 671-2979. Found , soccer ball at Tim Frank’s island. Contact Nathan Cooper, nathanscoope@gmail.com. Found: Bestway Towable Tube, Blue and White. Contact Allan Landsberg, 17 Grand Allee (819) 671-2641. Found,in the Spring at Wright’s shoreline, 207 Vipond Rd , large dock with sign attached. Contact Rob Wright at robwright9@gmail.com , 207 Vipond Rd. Found in the South end of the lake, Salus Life Preserver, Small – Medium. Can be picked up at the Cooper dock, 42 Watt Rd. Found, near the Howard/Foy cottages: White Pelican Rowboat, no motor, fibreglass, and a kayak paddle. Contact Jason Foy, jayfoy@Hotmail.com, (819) 671-1178. 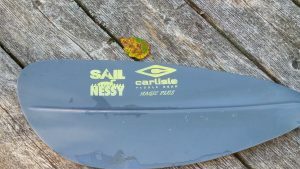 Lost, 12 ft Yukon aluminum boat . Please contact Terry Guilbault at (819) 671-4837, cell 613-797-2296 or Catherine Mullen at 613-863-5600. 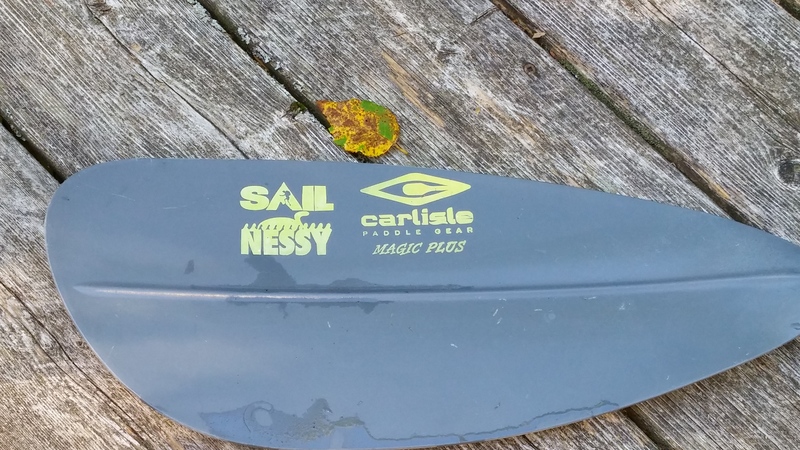 Found near south end island, Princecraft , 14 ft tin boat, no motor. Can be picked up at Mike Avon’s dock. Submitted by Shawn Howard. Lost, ramp, approx. 14′ X 4 ‘, cedar. Please contact Sue or Abby at 613 730 7401 (home), 613 219 7401 (my cell), or 819 4571289 (cottage). Lost, 14ft x 14 ft dock from Foy property. Please contact Daphne at daphnegfoy@gmail.com. 2-3 days ago a swim raft floated in towards our place. It is about 10×10 ft and is situated in front of our neighbours property – Marchand on the right of ours looking from the lake. Found: floating dock, 20 ft by 4 ft. Currently moored at 75 Portage at the very south end of Grand Lake. Call Louise or Paul at 819-671-7526. 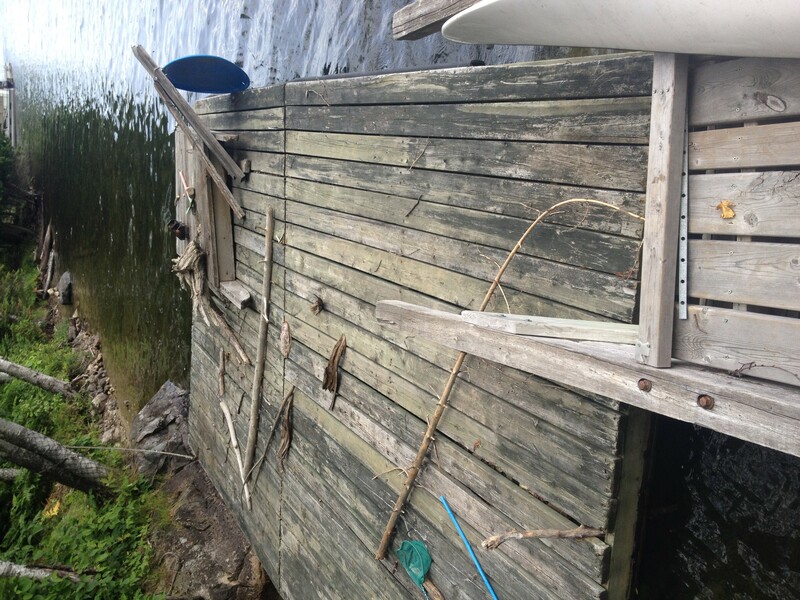 Lost, large dock 20ft x 4 ft from the front of Nicol’s cottage at 261 Chemin du Barage. Contact Jim Nicol at (819) 671-2625 or (613) 255-3141. Kayak now at the Cooper-Jamieson dock, 294 Ch Lac-Grand. Found during the recent storm – a large mainly white windsurfer board. It is standing up on the shore of the Langlois cottage in the North end and can be seen from the lake. Friday’s storm brought a grey wooden Muskoka chair to the Dubois/Méthot dock at the south end of Grand Lake (75 Portage Road). Please call 819-671-7526 to reclaim it. 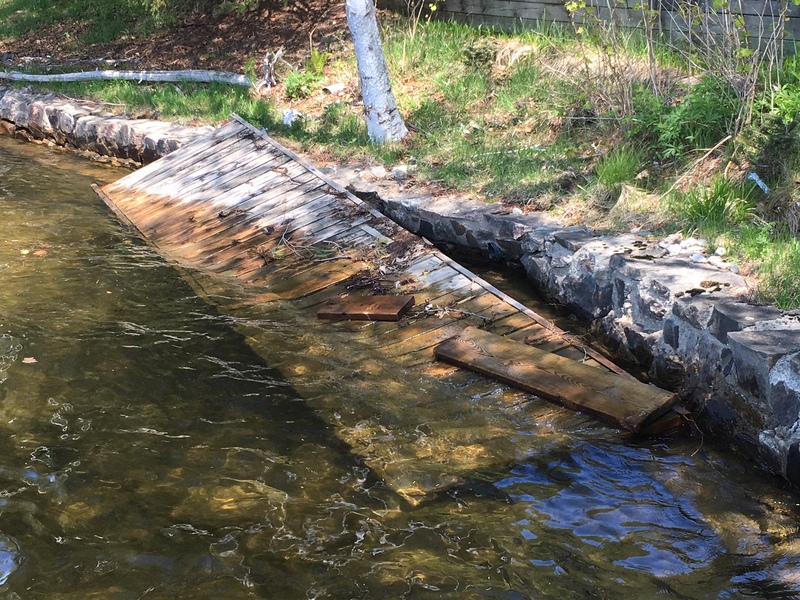 Dock, approximately 8X12 ‘, found at Brian Reynolds’ dock. Contact Brian at 819 671-3711. – April 2012 : lost by Jim Nicol -a dock 4 ft x 10 ft. If found please contact Jim Nicol at 819-671-2625 or Jim Nicol Jr. at 819-671-8116. – August 2011: lost by Judy Meloche: a large black plastic float (for under dock). If found, please contact Judy at judymeloche@ymail.com . – July 27, 2011 – lost by Don Costello: an O’Brien water ski in the area of the culbute. If found, please call Don at 613-722-2075 or e-mail at corpgolf@sympatico.ca . – July 5, 2011 – found at Judy Meloche’s, a large wharf 12 ft. x 12 ft.
– found weekend of July 1st, 2011: a small wharf on the small island with the cross. – found weekend of July 1st, 2011: a white paddle board on shore in the Narrows. 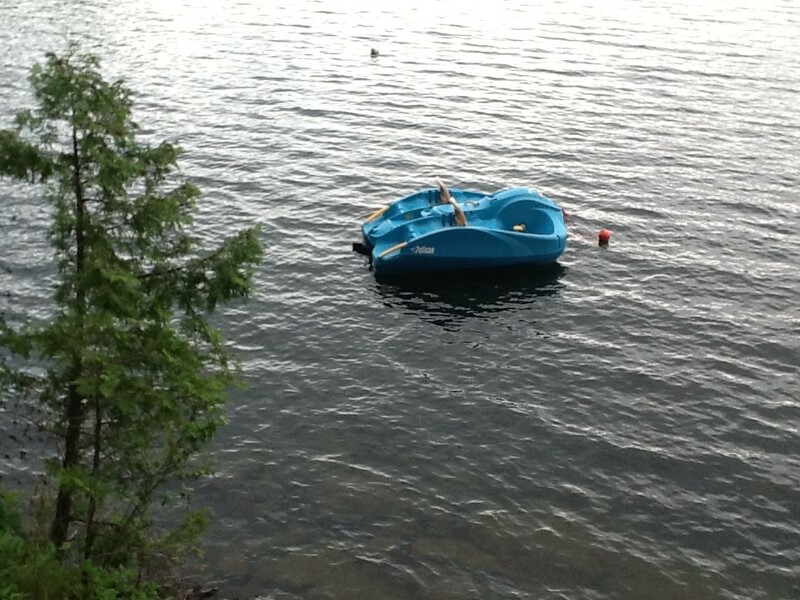 – May 2011 – found at the end of the island across from Wyn Dempsey’s cottage, southwest end of Grand Lake – one yellow paddle boat. Call Wyn Dempsey. 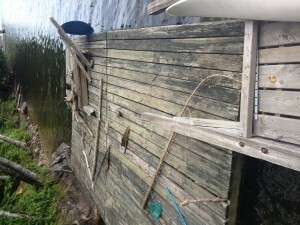 -May 2011 – found at south end of Grand Lake – one grey fibreglass fishing-type boat; looks new; in the marsh near Gary Beach’s cottage. Call Wyn Dempsey.